Shirts With Random Triangles: Sylvester Stallone Says He Is An Ex-Rambo. 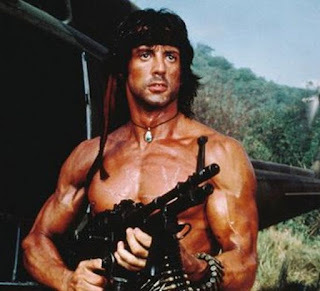 Sylvester Stallone as Rambo, Img. via comicbook,com. Bad news for Sylvester Stallone fans who were hoping to see Sly return to the role of John Rambo. The 69-year old actor told Variety's Ramin Setoodeh that a fifth Rambo film doesn't seem to be in the future. Stallone also says he is not involved with the proposed Rambo: New Blood series about the son of Rambo currently under development at FOX. There is, however, the strong possibility Stallone to return as his most famous character, Rocky Balboa, in a sequel to the 2015 hit Creed. The film, where Rocky returns to help train Adonis Johnson (Michael B. Jordan), the son of Apollo Creed, has been a surprise hit at the box office and with critics, earning over $100 million dollars.